the image tells a lot. love the relaxing pace you have in the work. Thanks, Jingle. I appreciate your comments and continued support. It’s tough to be separated…and the necessities of life so often conflict with the wants. Wouldn’t it be lovely if we didn’t have to worry about money? I’m glad she was okay. I don’t know much about badgers, but they can be dangerous, can’t they? Badgers are not fond of close contact with humans, that’s for sure. But they won’t attack unless cornered because they’re incredibly shy, nocturnal creatures, I believe in the same family as skunks. She probably wasn’t in any real danger unless she moved at the wrong time, in the wrong way. Regardless, he never realised she was there – he just walked – literally walked on her toes – totally oblivious of her presence. It was one of those moments that one can’t help but wonder if, in all the history of earth, it ever happened before – and it may never happen again. Amazing. What a difficult position to be in. It would break my heart to be away from my man like that. Thank you for your comment – it confirms that her sense of loss, and her faith in him came through. Happily, it didn’t last for too long and they’re together now raising lots more cubs! separation is always difficult to handle.. but for life to go on these days, they’re having to do it I think! 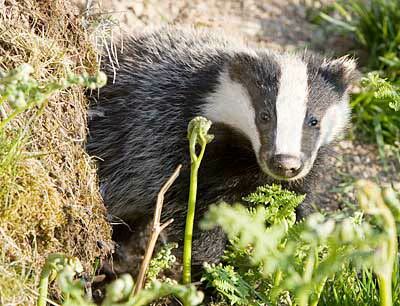 According to Badger, it’s nature’s way – each species doing its best to keep the family fed. Thanks for your comment! What a charming tale – so much longing, then brought back to reality in such an unexpected manner. Nice One Shot! Hi Eric, you must be an Exmoor farmer. (LOL) Thanks so much for the humor and your kind comments. I’ve seen your 2-horse logo before yet always when I was enroute to another blog, so missed visiting your site. I’m doubly glad you visited mine today, for now I’ll chase those two beautiful horses and read your work. This is delightful – in a somber kind of way. The combination of the couple separated and the badger foraging for food — humans and animals seeking much the same thing — emphasizes the poignancy. Excellent. You move us from the specific to the universal experience so eloquently. Thanks Cindy. some poems come out and bite you when you are least expecting. beautifully played out, and clear in its line… i like this so much, and am , whisper, slightly jealous. thank you for writing this. Thank you so much. I’m loving the unexpected bite. That’s worth ten times ten of something valuable. You make me want to go back and write more. Thanks. I love your responses – a teacher’s trained eye that reads deeper into the lines and sees the big picture. Your words, “universal experience” were the words I sought and could not grasp when seeking a title. Thank you, once again for your encouragement and great feedback. Love it. The things we do to ‘be happy’… it’s almost ironic really! Aah… these paradoxes! A very thought provoking poem, Cindy..
Ah Kavita, I should have known you’d “get it” – you would find the secret that shouts from the poem’s lines and that many readers missed. Paradox – great word. I also find some humor in this too, that silly old badger, so concerned about his business, he didn’t even realize he stepped on a human foot. How many of us walk through life, our problems on our shoulders, our noses to the ground, and we don’t see a damned thing around us? I wonder whose feet we tread on and how many miracles we miss. Thanks for being such a good reader. I always look forward to your comments. It’s your poems that are good…and they automatically demand good reading, Cindy! I really look up to your work! Thanks, Claudia. I’m glad you focused on the space. The first draft, pre-edit version raced along, making loops between her heart, that hill, the house, baby and London. It wasn’t until I wondered where the badger was going, that I realised he could show what the poem was all about, and I got the word machete out and went to work. Thanks for confirming I didn’t chop too much! Enjoy your week. I should be writing too. Bye! People whose native tongue isn’t English have a distinct advantage, in that they do things with the language that a native speaker wouldn’t think of – it probably was taught out of them. Some of the best poetry I have read was written in English by non-native writers – paying more attention to what they say and how they say it is a great way to write poetry!! You two gals are very gifted indeed. Keep the words coming!! Enjoyed how you weave the circumstances of couples and nature through your descriptions. Your lines have an intensity that I enjoyed. Thanks Adam. Intensity – I like that. I’ll put that on my wall for next Wednesday. Always enjoy your comments and so glad to see you back. Thank you so much. I really appreciate your comments and thoughtul award. As for the tag stuff, I’ll pass. If I allow myself to get into those, fun as they are, they become distractions that divert me from my novel and poetry-writing, which is my reason for being here in the first place. I hope you had a chance to read my comment on your blog yesterday. I stll feel the same – your story touched me so much. What a beautiful reflection. Wonder if the badger was thinking the same of humans. It seems men are always marching off to something and women are having to go somewhere to seek solace. The hills are a faithful friend. Believe me, yours flowed. You can flow on my comments section any time!! Thank you so much for your encouragement and support. This writer is truly grateful for what you do. Wow! What an encounter…and the symbolism of the badger is powerful combined with the slow, soft, lovely development of your piece! I am honoured to be connected with you through poetry! Thanks Annie. Your words have started my day with a warm feeling – we are so lucky to have this writer’s forum. I enjoy our connection too. Your wonderful writing and thoughts feed me with that magic that gets the creative juices flowing. It’s a win-win cycle. Your poem took me back to when my children were small and my husband had two part-time jobs on top of his regular job. It was important to both of us to have me stay at home with the kids, but it was often lonely without him. So many mouths to feed, he was like the badger in your poem. Busy providing the food for his family. Busy trying to balance wants and needs. Thanks for sharing your poignant, thoughtful poem. What a touching story – your husband was an amazing guy. Thank you for sharing this. You say such kind things and use the poetry to think about others’ ives and circumstances. You are a true student of the universe. This is very heartfelt, albeit too real for many of us. But there is that sad part…another creature trying to fend for her cubs, survival of the fittest! And she the victim…what an interplay of events…:) You have made a very distinct observation of the things that happen around you! Thanks, Amity – glad you enjoyed this and I appreciate your comment about the interplay, since I was trying to show how longing is a universal, cross-species experience. Thanks for sharing this old gem with one single impression. Hi Jingle. I wrote a new one for you, but this just seemed to fit the prompt better, so I slipped it in and saved the new one for another time. I hope readers don’t mind seeing it a second time. I am touched by your choice of words: knitted and space to feel – such wonderful words to describe what I was trying to achieve. Thank You! I think I’d have jumped a mile to have my toes stepped on by something, even something as harmless as a badger…. I bet they can really bite if they want to! This is so touching on many levels because I know these feelings so well myself. Thank you, daydreamer. 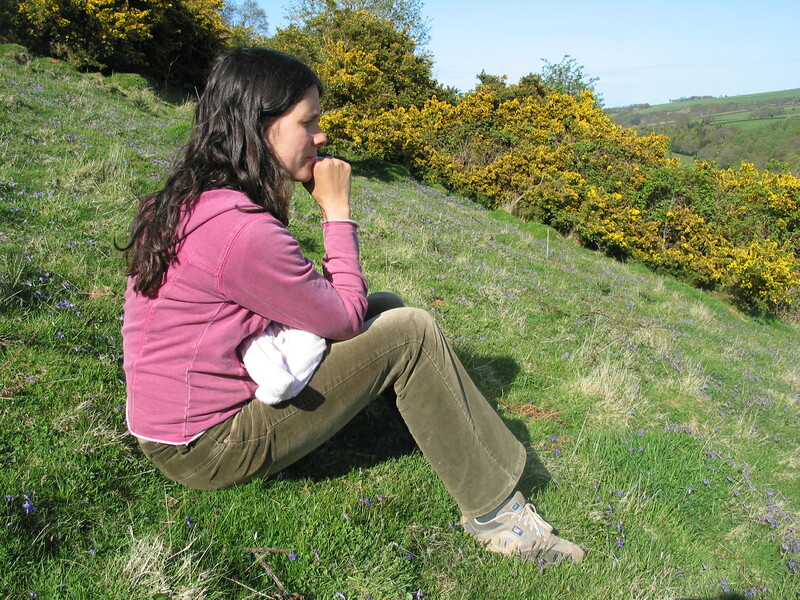 My daughter took me to the hillside where she sits and meditates and I took this photo (of her). While we were there, she told me about the badger stepping on her toes. She was always one of those people who nature seems to embrace, and animals, whether wild or tame, feel comfortable with her. This isn’t the only remarkable encounter she’s had, but the setting, her story, and the idea that we are no different from our animal friends who also have to sacrifice, inspired this poem. Yes, badgers can be quite nasty when threatened, as they are nocturnal creatures and very, very shy. They’re big too! When she was little, she used to walk with her Dad; whenever they found a badger set or fox den, they would go back and observe it. She never told anyone where they were, keeping the animals’ secret from human predators. Thank you for your comments – glad you enjoyed this. Fighting it out together ,sometimes could have a dual connotation. isn’t it? These are tough decisions to make and live with.Your poem captures this conflict so beautifully.I loved the way you have managed to carry the sentiments right till the end.Very well written. Thank you, Gyanban, for your lovely comments – they make me want to go back and read it again. For me, everything in life has dual or multiple connotations, and so many things seem to run on parallel lines for a time. The patterns are fascinating. Maybe they aren’t even patterns but random streams of synchronicity… who knows?